A quick little post for my boot sale mentor. This hunting, gathering, hoarding thing is in my blood, so to keep the merry-go-round of charity shops, mercatini, boot sales and flea markets going, I’ve started selling. 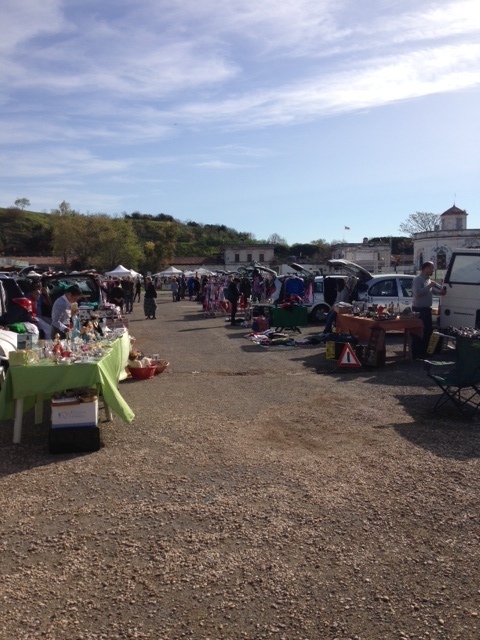 For months I have wanted to take a stall at the Car Boot Market out on the grass in front of the Citta Dell’Altra Economia in Rome’s Testaccio. 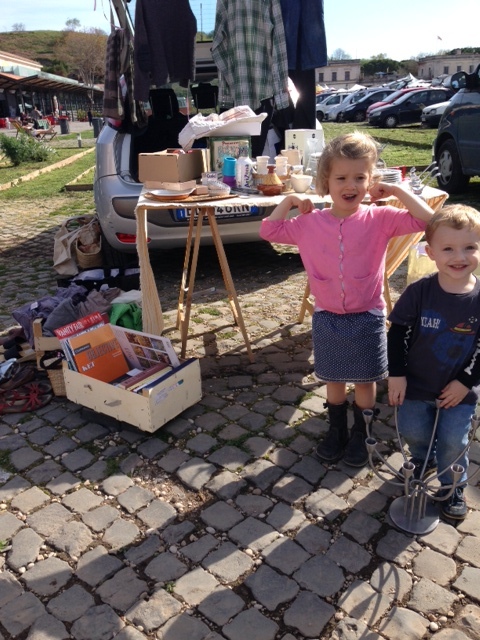 Thwarted by rain and ecological Sundays (where cars are banned) last Sunday dawned clear and smiling – just the day for a boot sale. The set up was pleasant, the compagni di banco (neighbors) friendly, the skies a soft blue. Some friends came by and Emma and Luca helped lay things out. As advised by my mentor I laid things out as nicely as possible. The sun rose higher in the sky, the customers dwindled, word went around the stalls that the day was so lovely everyone had gone to the beach. A woman lay in a deck chair nearby with what must have been a very good book. I traded apple and oat muffins for a rustic mushroom tart with my neighbors. The woman on the deck chair turned a light red and kept reading. Emma worked diligently away on a puzzle, ate her lunch and lay in our lounger. I sold a couple of books and some plates. Four well heeled German women cooed over my Guy Boyd ramekins. The sun started to sting and I pulled Emma’s hat down over her face and hid under the shade of the boot. I sold a lovely sweater I had shrunk in the wash to a young and much-slimmer-than-me girl. The sun stung and I realized the girl was going to have to put the sweater away until next year. The woman on the deck chair stretched and put her book away. The late afternoon strollers strolled. 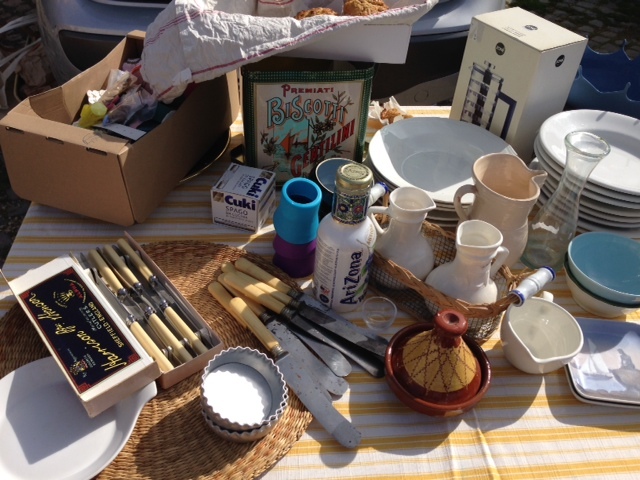 We packed our objects up and traded opinions with our neighbors, my thirst for a stall at a Boot Sale quenched, at least for a while. I wish we had been there! Looking at your stall there are at least a dozen things I want…. Hello….we live in London so sadly I’m unlikely to make it…..though we do get to Rome quite a lot so you never know….